President Trump has been on a working vacation at his golf club in Bedminster, N.J., holding only two public events this week -- one of his quietest stretches in a long time. But his thumbs don't take time off. This week we'll check three fact-challenged tweets that really stood out. Welcome to Fact Check Friday. As fires ravage California with record-breaking ferocity, the president ignited controversy, falsely claiming on Twitter that the state is mismanaging water supplies that should be available to fight the infernos. California has been fighting 13 large wildfires, including the largest one on record, all during the hottest month recorded in the state's history. The most critical fact that stands in the way of the president's statement comes from California Department of Forestry and Fire Protection, which says water is not the problem. Nevertheless, on Wednesday, the Department of Commerce ordered the National Marine Fisheries to "facilitate access" to water needed to fight fires in California. It also said that "protection of life and property takes precedence" over water allocation arrangements under the Endangered Species Act. That's where the order takes a questionable turn. Environmentalists and salmon fisheries fear that what's really behind the president's intervention is an age-old gripe from Central Valley farmers that not enough water is being diverted to them. Earlier this year the state decided to keep more water in the rivers to protect endangered Delta smelt and Chinook salmon, dealing a blow to those farmers... farmers who also happen to live in one of California's few Republican strongholds. The Department of Commerce has not responded to repeated requests from ABC News about this question. "Most biting sanctions ever imposed"
Just after midnight Tuesday, the first round of U.S. sanctions suspended under the Obama-era Iran nuclear agreement snapped back into place as a result of Trump's decision to pull out of the deal. In Trump words, they were the "most biting sanctions ever imposed." "The Iran sanctions have officially been cast. These are the most biting sanctions ever imposed, and in November they ratchet up to yet another level. Anyone doing business with Iran will NOT be doing business with the United States. I am asking for WORLD PEACE, nothing less!," the president tweeted at 5:30 a.m. Tuesday. There is no doubt these sanctions -- on gold and precious metals, currency transactions and more -- will hurt Iran, but it seems dishonest to characterize them as "the most biting." And as the president mentions, these are only the first wave of sanctions being put back into place. Tougher sanctions on Iranian oil and its Central Bank are expected to snap back in November. But even then, the U.S. sanctions will be without companion sanctions from Europe, Russia and China that were lifted as part of the international Iran nuclear agreement. Trump pulled out of the deal without their support. So to call them the most "biting sanctions ever" doesn't have the ring of truth to it. 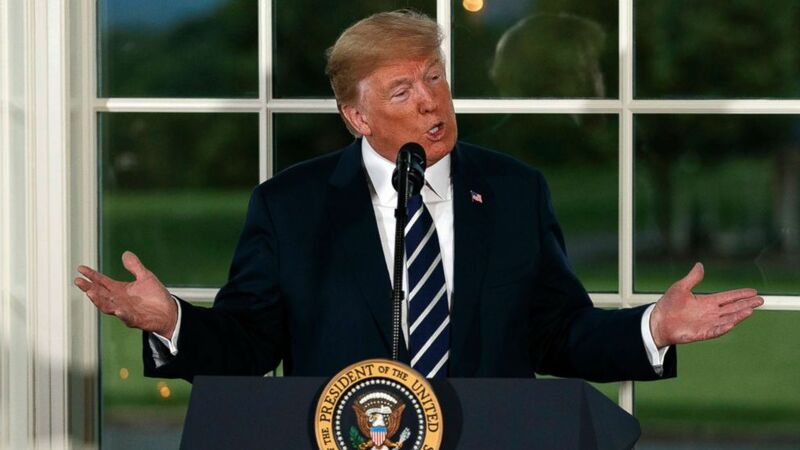 In an apparent attempt to sell the benefits of his trade war, President Trump made the claim this week that his tariffs will help reduce "large amounts of the $21 Trillion" national debt.The New York Times published a great piece breaking this all down and the simple conclusion they drew, which should be obvious to the check-book balancer in all of us, is that the math doesn't add up. First of all, before you can even begin to reduce the national debt, the U.S. government first has to balance the annual budget. That means it has to start spending less than it makes every year. The Congressional Budget Office projects the federal deficit will rise from nearly $800 billion this year to over $1 trillion in 2019, due in large part to the president's tax cuts. In the meantime, the Treasury Department expects the U.S. to collect only about $40 billion from tariffs as of 2018. That's not even close to the $1 trillion deficit, not to mention $21 trillion debt.